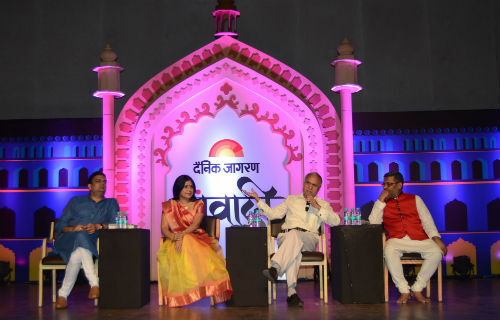 Lucknow: Some of the best names in the country have gathered on the first day of the fourth Dainik Jagran Samvadi, a three-day festival celebrating the power of expression in Lucknow’s Bhartendu Natya Academy. The festival will go on till Sunday. The festival commenced with the inauguration by Vishwanath Tiwari, President, Sahitya Akademi. Mr. Tiwari said that expression and communication was important for a harmonious world and that there would be violence without it. Present as the Chief Guest, Deputy Chief Minister of Uttar Pradesh Dr. Dinesh Sharma highlighted the importance of communication between a political leader and the public. Talking about the stories from the small town being showcased on the big screen Vani Tripathi, Adwaita Kala ,Pankaj Tripathi ,Vineet Kumar Singh. The session was moderated by seasoned film critic Ajay Bramhatraj. The day came to a thunderous close with Dastangoi by Fauzia and Fazal. They recited anecdotes from the epic Mahabharata and enthralled the audiences with their exceptional storytelling.